So, James Malm 80% chance proven to be completely wrong and had also proposed the same date in the Summer of 2011–the fact that he stuck to it until a couple of weeks before it was shown to be wrong should show others on how he relies more on his own understanding than watching events like Jesus said (cf. Luke 21:29-36). James Malm seems to have a trend of speculating on dates in the very near future which biblically have no hope of being fulfilled. When will his “followers” realize this? Anyway, there is no possible chance that Pope Benedict will set up the abomination that James Malm is talking about in 2013 either. 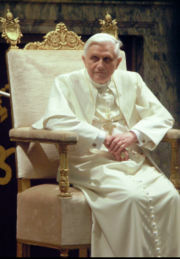 This will not happen for at least 3 1/2 years, and much likely longer than that, and it is unlikely that Pope Benedict would be the one for many reasons (including his age and his apparent actual beliefs). There is no possibility that the Great Tribulation can happen in 2013 or 2014 and those who rely on the Bible have realized this for at least the past three years. It is only those who overlook scripture and rely on their own views who make the mistake of thinking that the Great Tribulation can, or could, happen in 2012/2013/2014. James Malm really should have read my book 2012 and the Rise of the Secret Sect when it came out three years ago instead of criticizing it without reading it. World events have already aligned with at least two dozen predictions in it and more will as well. If James Malm would have paid proper attention to it, it would have saved him from teaching that there was any possibility of the Great Tribulation beginning in 2012. James Malm will be proven wrong again. His followers really should read the Bible and if they still think he could possibly be right, also read 2012 and the Rise of the Secret Sect as it will explain a lot of what James Malm (and others) do not understand. The Great Tribulation is coming, but it will not begin in 2012 or 2013. Error-Ridden James Malm Not Doing an Elijah Work James Malm is an ‘independent’ who misunderstands and improperly maligns. This entry was posted on Tuesday, October 16th, 2012 at 1:02 pm	and is filed under COG News, Prophecy.